The Aussie picks up pace and regains 0.7100 and above. AUD remains bid despite growth concerns. The pair stays supported around 0.7000. The Aussie Dollar has started the week on a positive note and has lifted AUD/USD to fresh daily highs in levels beyond 0.7100 the figure. Spot keeps recovering part of the ground lost in the last couple of sessions, managing to reclaim the critical 0.7100 handle while finding decent contention around the psychological 0.7000 neighbourhood. Concerns over a global slowdown, particularly in the Chinese economy remain in centre stage, although recent comments from Chinese officials have emphasized the capacity of the economy to deal with downside pressures, all lending support to AUD. 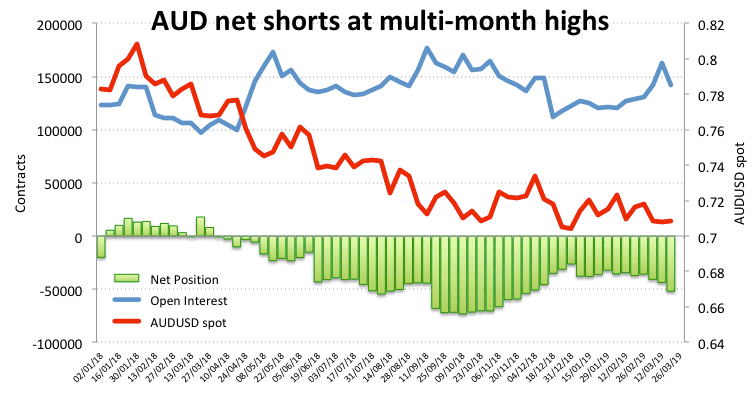 On the positioning front, AUD speculative net shorts climbed to the highest level since late November 2018 during the week ended on March 19, according to the latest CFTC report. The broad risk-appetite trends continue to drive the sentiment in the high-beta currencies and the commodity-bloc, where developments in the US-China trade dispute remain the almost exclusive catalyst of the price action. Recent RBA minutes confirmed the shift to a more neutral stance from the central bank, while market participants continue to price in a rate cut at some point in H2 2019, all keeping the medium term bearish outlook on AUD unchanged for the time being. At the moment the pair is gaining 0.27% at 0.7098 and a breakout of 0.7131 (55-day SMA) would aim for 0.7168 (high Mar.21) and finally 0.7215 (200-day SMA). On the downside, the next support emerges at 0.7003 (low Mar.8) followed by 0.6907 (monthly low Sep.4 2015) and then 0.6827 (monthly low Jan.26 2016).